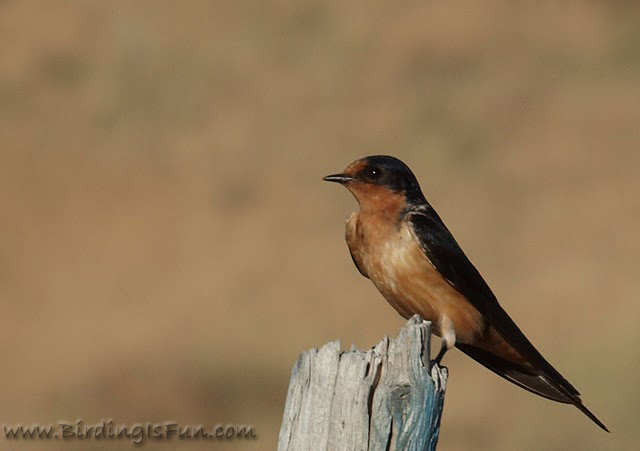 Barn Swallows arrive each Spring in the intermountain west at about the same time as the Northern Rough-winged and Violet-Green Swallows. Almost all the swallow species migrate out of here by mid-October, but the Barn Swallows are often the last to migrate south, remaining until about the 3rd week of November. I find Barn Swallows most often flying around near bridges spanning the many irrigation canals found in the areas I have lived. Under those bridges they build cup-like nests with hundreds of tiny mud balls they scoop up in their bills. They do nest in barns and even over the front doors of homes when there is plenty of protective cover, like a covered entry way or covered patio. In flight, the forked tail is a helpful identification trait. In the last two years I have come a long way in my swallow identification, especially when they are in flight, and even by sound. The Cliff Swallow is most distinguishable by its white headlight; that white patch on its forehead. It also shows a rump patch and tends to appears larger and bulkier in flight than the Barn and NRW Swallows I typically see them with. Cliff Swallows I have found to be true to their name, nesting on rocky cliffs. I have also found them nesting under bridges and on buildings and other structures that act like man-made cliffs. Like Barn Swallows, they build their nests out of tiny mud balls, but the shape of a Cliff Swallow nest is more gourd-like. In the Boise area, near Lucky Peak Reservoir, Rosy-finches use Cliff Swallow nests to roost in at night. Northern Rough-winged Swallows are typically the second swallow species I see in Spring. I call them the brown swallows, because that is how I identify them. They're just kind of brown on top and lighter brown to white underneath. I have found them nesting in burrows they excavate dirt banks usually close to water. 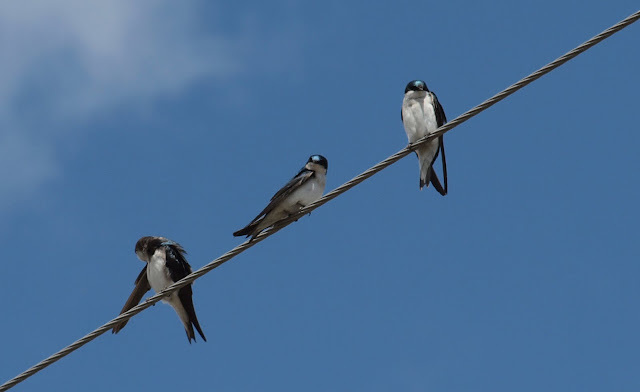 According to my experience, and confirmed by eBird, Tree Swallows are generally the first of the swallows to return to the intermountain west. I usually see them flying high above cottonwood trees over a river or pond. The only place I have seen them nesting is in man-made nest boxes. Being cavity nesters, I am sure they live up to their name by nesting in woodpecker-made tree cavities. The dark, but iridescent colors on the back contrasting with the white underparts helps me identify them. They are somewhat easy to confuse with Violet-Green Swallows, but notice how the dark helmet or hood comes down past the eyes. In contrast, Violet-greens have some white that comes up over the back of the eye. Bank Swallows tend to be the last swallows to arrive in migration and one of the first to leave too. They are blackish-brown on back and white underneath, but their black neck-tie helps you identify them from below. Also true to their name, they nest in sandy banks. I have noticed that they prefer more sandy soils to burrow in compared to the dirt banks that I see NRW Swallows nesting in. Now, my goal is to capture some good photos of Violet-Green Swallows and to have my first ever sighting of a Purple Martin which do occasionally pass through Utah. Beautiful captures and a great post! @MaineBirder - thanks for the comment. I sure enjoy your blog! @Rezervesana - Welcome to Birding is Fun! Great photos and interesting info! Robert, wonderful post and photos! The tree swallows have come to my Stirling St. Swamp and I am sure they are nesting in the many tree holes there! Just last week I saw my first Northern rough-winged swallows. I have yet to see cliff, or bank swallows this year. I have seen barn swallows in other locations and I am seeing chimney swifts everywhere! A flock of 3 was flying noisily over my mother's house this evening!